In lieu of a film, how about some more vintage <i>Filmfare</i> pictures? 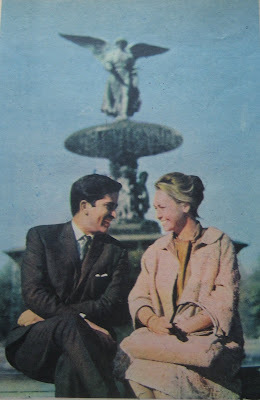 In lieu of a film, how about some more vintage Filmfare pictures? This heat has melted my brain and I just cannot get traction on my writeup of a fabulous early Shashi Kapoor film in which he fights a bear. (Oh yes. That happens.) I do seem to have the brain power to crop and upload photos, so here are a few more from some of the many old Filmfare issues I have been able to check out from my university library. 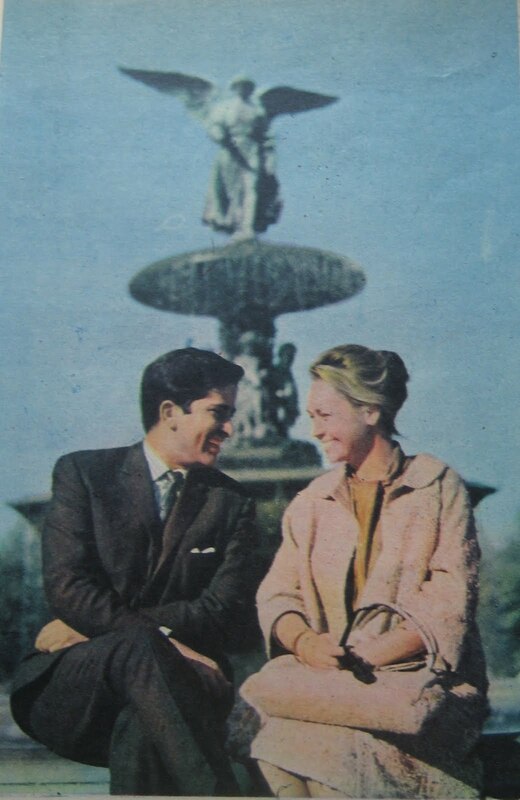 This set is for those who loved the picture of Shashi Kapoor and his late wife Jennifer Kendal in Manhattan in 1963 in my previous post of family photos. 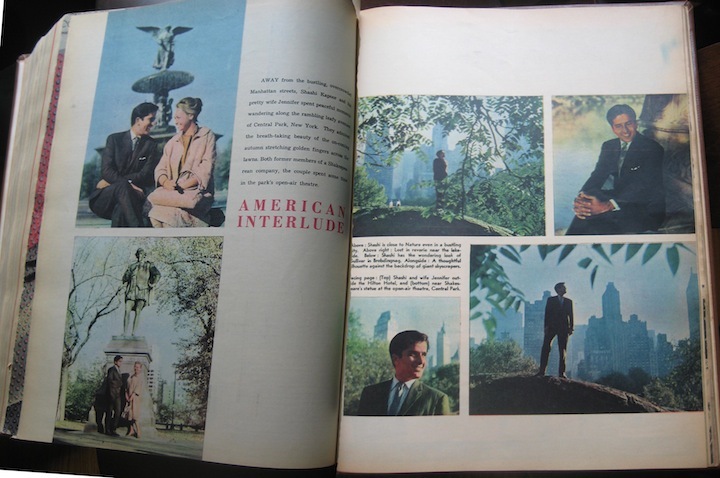 Here are a few more, I think from that same trip to New York, from a December 1963 issue of Filmfare. 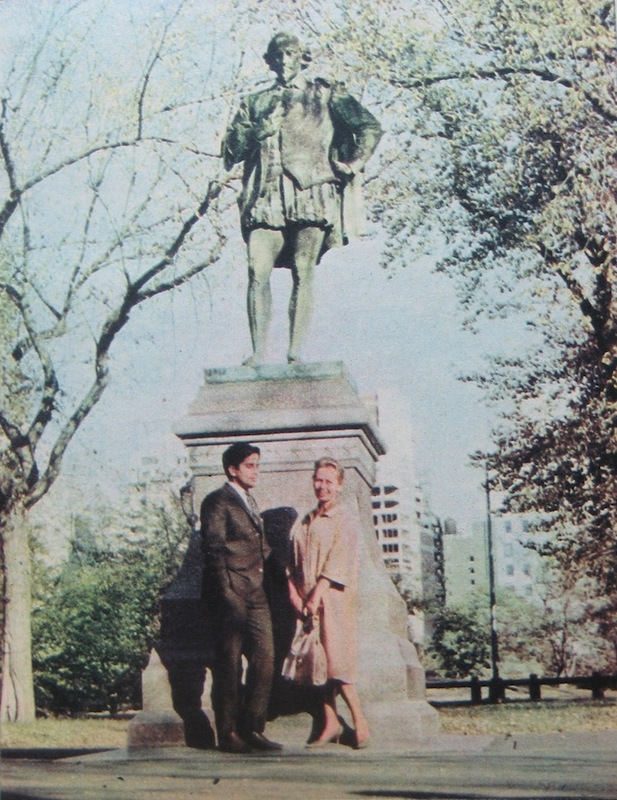 Away from the bustling, overcrowded Manhattan streets, Shashi Kapoor and his pretty wife Jennifer spent peaceful moments wandering along the rambling leafy avenues of Central Park, New York. They admired the breath-taking beauty of the on-coming autumn stretching golden fingers across the lawns. Both former members of a Shakespearean company, the couple spent some time in the park's open air theater. 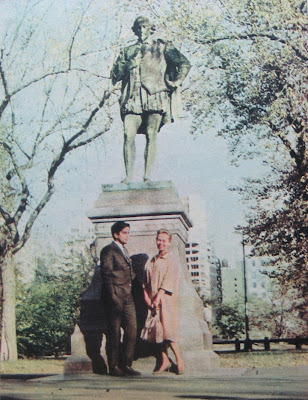 "(Top) Shashi and wife Jennifer outside the Hilton Hotel and (bottom) near Shakespeare's statue at the open-air theater, Central Park." Above: Shashi is close to Nature even in a bustling city. Above right: Lost in reverie near the lakeside. Below: Shashi has the wondering look of Gulliver in Brobdingnag. [Below right]: A thoughtful silhouette against the backdrop of giant skyscrapers. As much as I enjoy the photos, the text drags them down into a taint of space-filler. And I love the layout and bold pink title! Next up: assorted Kapoors from assorted Filmfares. Seeing these pictures REALLY makes me want to get hold of Shakespeare Wallah. I still can't get over how MUCH like her younger sister she looked! It's fascinating to me to think about who was the photographer. Did Filmfare have a New York office? Did they send a photographer from Mumbai along with the Kapoors? You make me all nostalgic for the 70s..sigh ! She sparkles, he shines- love em! maxqnz - Shakespeare-Wallah is one of my favorites! Do let me know if you get to see it! Agree, the Kendal sisters look very similar. liz - Now that you mention it, that IS a good question! Maybe we too can hire such a photographer (and wardrobe crew and hairstylist and Shashi-lookalike...). suja - Hee! I feel that way all the time and I wasn't even born until 1974. Shilpi - They're so lovely, aren't they? As for the source of these old Filmfares, I work at a large research university and they're in our library!